Georgia-based jamband-superstars Widespread Panic played a recent Saturday night show over in Huntsville, Alabama. This is a band that I've seen probably 25 or 30 times and have been listening to for about 15 years, and since the show was on a weekend (a rarity in this isolated part of the country), I couldn't pass up the opportunity for a night of good times, grooving and shaking. My good friend Britt Hester, a local music fan and Panic veteran, made the 3-hour drive from Tupelo with me. 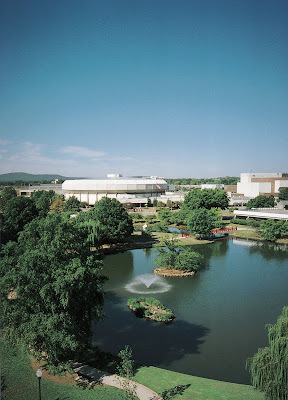 The Von Braun Center, where the Widespread Panic concert took place. Huntsville, Alabama, known as the Silicon Valley of the South, is quite a booming city these days. 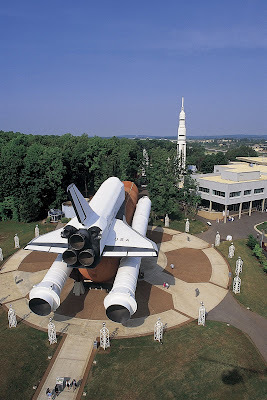 Set right at the tail end of the Appalachian mountains, it is home to the NASA Space and Rocket Center as well as the US Army Missile Command. There is a large number of defense-related high technology companies in the area, and our hotel was right next to the Space and Rocket visitor center. This was the view outside our hotel window. 1. Old-school setlist! Except for 2 songs (Flicker, Bust It Big), the setlist completely avoided any material from the past 7 or 8 years, and could have been played in 1998 or 99 (the glory-days of Widespread Panic, in my humble opinion). Quite a few of my favorite songs got played. Maybe it had something to do with it being lead singer John Bell's 45th birthday? 2. New guitarist Jimmy Herring was on fire! Last fall when I first started hearing recordings of Panic w/ Herring, I was a little skeptical. I just wasn't used to hearing Panic with that style of guitarist. 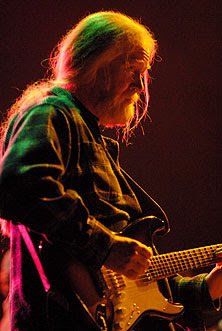 Actually I'm still in the process of adjustment, but I can say with certainty that the Jimmy Herring fans can no longer complain about Jimmy "holding back" with Panic. He was just ~shredding~ for extended periods; as the show went on, he just got more and more amped up, and his most blazing work might have been during the encore, in the jam that led from the War cover "Low Rider" to the Talking Heads ballad "Heaven". 3. Finally, Panic has ditched the Grateful Dead-style "Drums" break in the middle of the 2nd set, which I'd been hoping would happen for years. I never liked the way "Drums" disrupted the energy and flow of the 2nd set. (I didn't mind it with GD for some reason) Instead, they now have several "mini-Drums" breaks throughout the 2nd set, usually 3-4 minutes, during which none of the band members leave the stage. Much better! 4. Highlight of the show for me was the late 2nd set "Airplane", a song I hadn't heard live since original guitarist Mikey Houser's passing more than 5 years ago. I'd never heard it without Mikey singing, but naturally, JB handled it just fine and sounded like he'd been doing it for years. And just like in the old days, the jam out of "Airplane" was EPIC, with multiple peaks back-and-forth between Herring and JoJo (making it extra-funky on the clavinet). 5. Another highlight was the "Electric Funeral" jam that led out of "Mercy" - a Black Sabbath cover (sans vocals) that took the band into unusual territory - dark and haunting - before building in intensity and finally shifting gears into a balls-to-the-wall cover of NRBQ's "Flat Foot Flewzy".